Bring refined elegance to your adventuring style when you drape the Mens Elven Cloak over your shoulders. 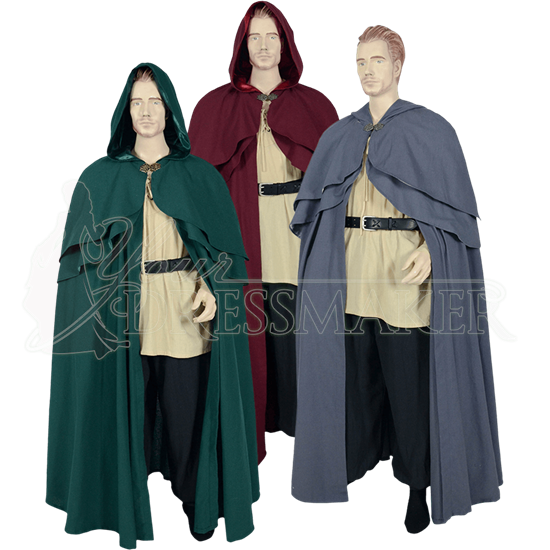 This hooded cloak blends fantasy and medieval inspiration, creating a versatile outerwear option for rangers, elves, and more. Made of natural, 100% cotton, this long cloak has two shorter layers of fabric over its shoulders, their fronts rounded and then tapered to points in the back that match the point of the roomy hood. Matching satin lines these two features, adding an element of nobility to the design. This medieval fantasy cloak is secured in the front using your choice of a silver or antique gold Celtic-style clasp. Many colors are available, so no matter your character, this woven cotton cloak will add refinement and mystery to your look.